Children are exposed to an endless array of germs, and while there isn’t much you can do about that, you can still protect your children from the ill-effects of those attacks. Keep reading to discover 7 super ways to boost your child’s immunity naturally. A diet full of processed foods with artificial colouring and flavouring agents and lots of fat, sugar and sodium has been found to suppress immunity, and unfortunately, that’s exactly what most children tend to be drawn to. Try to make home cooked meals for your little one as much as you can, and use fresh produce and natural foods. If cost or time is an issue, there are so many frozen varieties of fruits, rice, beans and vegetables to make it easier. A good number of studies have highlighted the link between sleep deprivation and increased susceptibility to illness today, and that’s exactly why getting a good night’s sleep on a daily basis is important- not just for your but for your little one too. Toddlers require around 12 hours of sleep everyday, it helps strengthen their immune system’s natural killer cells. Exercise isn’t just important for you- it is essential for your children too. Research has shown that exercising on a daily basis can increase the number of natural killer cells in the body, can relieve anxiety and can also help children develop the lifelong habit of fitness. A diet rich in fresh fruits and veggies is an absolute must for children, it helps give their bodies all the good stuff- the phytonutrients (particularly carotenoids and vitamin C) that boost immunity and protect the body from disease. Nuts and seeds are great too if your child isn’t allergic to them. Also include more of legumes, fish, poultry and eggs. Chronic stress and anxiety has been found to affect the body in more ways than one, and yes, in the fast paced world today, children too, are overstressed and overscheduled, which in turn, lowers their immunity due to the rise in the levels of cortisol and adrenaline. Make sure your little one gets enough time to relax and rest, and not take up more than he can handle. 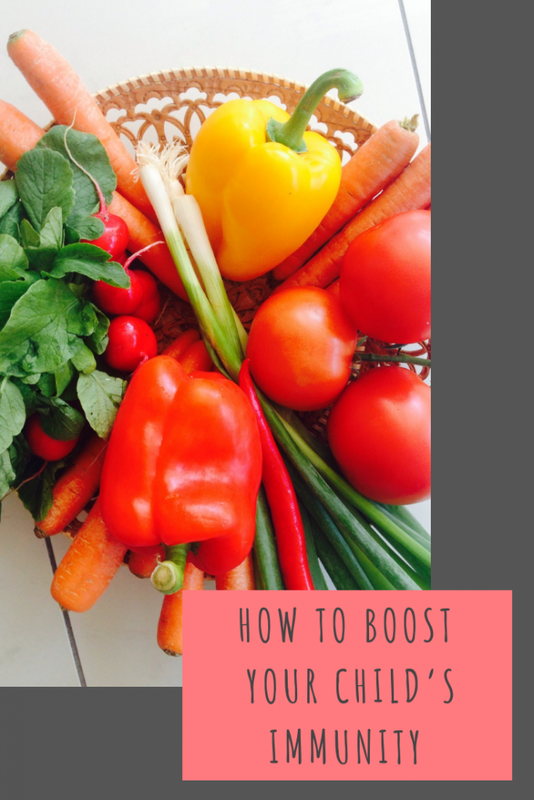 There are certain foods that are known to be immune boosters, they work wonderfully in strengthening the body and adding them to your diet is a great idea. Foods like garlic, green leafy veggies and berries in particular are the best, find a way to sneak these on your child’s plate to strengthen his immune system naturally. Also consider a multivitamin to take daily. There’s a reason why probiotics have become so popular- they work wonders in improving gut health and boosting immunity. Try to include more of probiotic foods in your child’s diet as well, it will help detoxify his body and shield the body from the attack of viruses and bacteria. Taking steps to limit the consumption of processed foods can also help take it up a notch. Great tips! I need to boost my kids immunity, we’ve all had the sickness bug! These are great tips. I actually cook more home-cooked meals since we moved to Portugal but mainly because processed food (like those available in the UK) aren’t available or are very expensive. I also give my son multivitamins and he’s outside most days when it’s not raining. He’s rarely ill since we moved, thankfully. I agree with all these tips. Kids need a good diet and sleep to boost their immunity. I think a great diet and lots of sleep will help you boost your child’s immunity.